(L to R) Detective Sullivan, Sgt. Riley, Deputy Levin and Detective Gore were standing watch around 2 p.m. Tuesday at the corner of 30th Street West and Avenue K, as part of a daylong tribute to mark the 36th anniversary of the traffic collision that claimed the lives of Deputy Sheriff Gregory L. Low and Reserve Deputy Sheriff Charles Plumleigh. LANCASTER – The Lancaster Sheriff’s Station Tuesday (Feb. 26) erected a temporary memorial at the corner of 30th Street West and Avenue K to honor two fallen officers – Deputy Sheriff Gregory L. Low and Reserve Deputy Sheriff Charles Plumleigh. Thirty-six years ago on Feb. 26, Low and Plumleigh were on their way to a burglary-in-progress call, when their patrol car collided with a second patrol car at 30th Street West and Avenue K in Lancaster. Low, 30, died on the day of the accident, and Plumleigh, 21, died a few days later. For the past few years, the Lancaster Sheriff’s Station has marked the Feb. 26 anniversary with a memorial at the crash site. From 6 a.m. to 6 p.m. Tuesday, at least two deputies would be standing watch for a daylong tribute at the memorial site, Ruiz said. Around 2 p.m., drivers passing by were honking their horns in support while some passengers waved at the officers. 5 comments for "A tribute to the fallen"
Yeah, because auto collisions are totally something that regular people don’t risk having every day. Your job ain’t that risky hun, I got the same risks you face every day. I knew them both. Good cops, good people. The LASD stands there on that corner to honor them and it is far from a waste of our tax dollars. What a waste of the taxpayers money. This brings back a very sad memory for me, as I was in Charles Plumleigh’s LASD Reserve Academy class, and he was both a friend as well as my partner in many of our academy activities. I was devastated over his loss at such a young age, and had to watch his parents and fiancé’s grief at his funeral. I am glad to see that the Sheriff’s Dept. 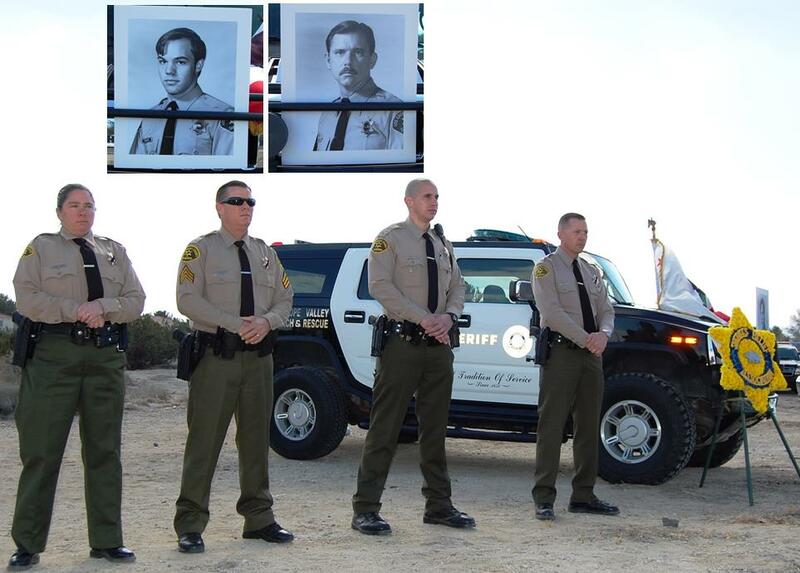 holds an annual tribute to both of the deputies killed in that tragic collision after all of these years. Well, bless your hearts. What a wonderful way to honor your comrades. I didn’t know about this and I think it’s wonderful. Stay safe guys!